We should always be thankful to all the blessings that we have constantly been having without a pause. God has always been great and kind towards us, so we should never miss the chance every day to thank Him for all His benevolences. There is no such particular day to thank people as well, we should have the courtesy and decency to at least appreciate somebody’s kindness towards us. Your good words can win hearts. Sometimes it is not the money, pounds and cents that may provide people a little help but only the company, warmth and kind gestures of yours are a great help to them. It is said, nobody dies of poverty or hunger, people die because of loneliness, and they die of lack of love. So surround yourself with people who value you, spread happiness, and bring positivity into your lives as well as to the lives of others. Well Thanksgiving Day is around the edge, it has been celebrated in USA since a century ago so in the month of November we all get ready to pay gratitude and homage to all the harvest that we get in the running year. Just after the day of Thanksgiving, there comes Cyber Money which is a term used by sellers who open up discount packages and sale deals to attract people to shop online for the goodies and the favorite stuff they want. 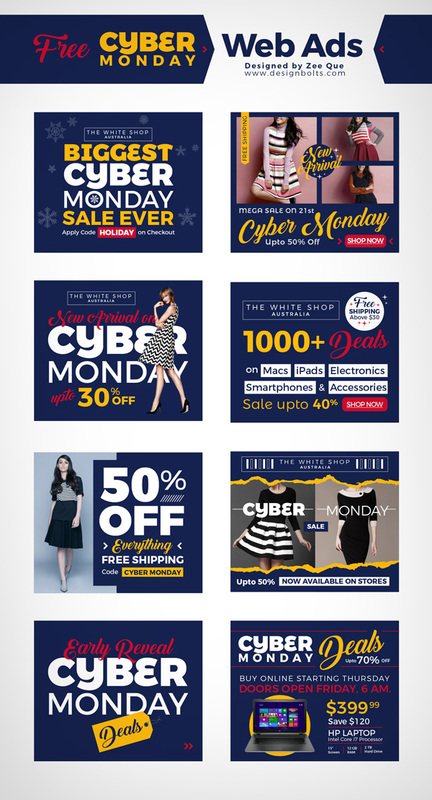 Previously i share black friday deals & black friday ads, now today I am providing you a post of free premium Cyber Monday Deals / Sales Web Ads in Vector Ai Format. If you are running your own blog, or working as a designer on a client’s project, you can use this web ad to be displayed on the respective websites/blogs who offer good, big and small Cyber Money deals and sales’ stuff. Check these ads out, they are eye catchy, deviating, impressive and on point. Stick around for more happenings and trends in the world of graphics, art, tech and design. We are all set to showcase more of this kind, but stay tuned and hold on tighter. I wish you all a very pleasant holiday time and a season full of festivities.